My last week's WIP Wednesday was full of new projects, 2 quilts, and 2 pillows, to be precise. Guess how much progress was made on either one of these four? None!!! Absolutely nothing!!! I did not even touch them all week long. Not to say that I didn't sew. Not at all. I was actually pretty busy and managed to produce quite a few finished projects, there was just something about already started projects that did not attract me at all. I made 2 new pillows for our living room. You can read more about them here. With all 3 of my kids at school now, we're still in the "back to school" mood. I made a long promised messenger bag for my middle daughter. I just love how it turned out. What do you think? I helped my oldest daughter cover her textbooks and made fabric book covers for all of them. 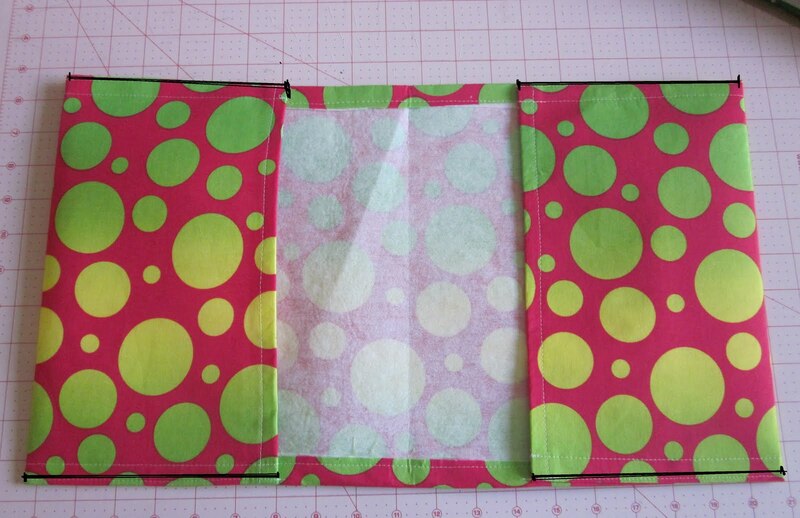 I posted a tutorial on how to make these easy book or notebook covers here. One last project I'm going to share today is this table runner/ wall hanging. I had no pattern or any exact idea what I really wanted it to be when I started. I like how it turned out, I just don't think it looks good on my dining table (that was the reason I made it). I will probably re-make it into something else and keep on my quest to make a table runner that would be "just right" for our dining room. Any suggestions? I love the binding on this guy, though. It's Cherry Fizz by Barbara Jones of Quiltsoup for Henry Glass. I bought a yard at Fabric.com but I have to go back and get a lot more. It might be my favorite polka dot fabric right now. I really hope to dig into my last weeks WIPs and show you some finishes next week. My oldest daughter started Middle School this year and she was required to cover all her textbooks in brown paper bags to protect them. Makes sense, right? The only problem is that all the books then look the same, and ugly. There is absolutely no reason a girl should walk around school with her books covered in brown paper when her mother has shelves full of gorgeous fabric on hand. She chose the fabric, I made covers. They were so easy to make and made books so much more cheerful that I thought I'd share with you how to make some for yourselves. Start by measuring the book. The one I was covering was 9" wide, spine was 2", and the height was 10.5". Now on to some math, don't worry, all we do is some simple addition. It's and easy book cover, after all. shorter side: height of the book + 2"
Using this formula, I cut out a piece of fabric that was 9 + 2 + 9 + 10 = 30" x 10.5 + 2 = 12.5"
Also, cut medium weight interfacing the same size as your fabric rectangle, in my case 30" x 12.5". Fuse it to your fabric using manufacturer's directions. Mark 3/4" along both short sides of the fabric. Fold it down, wrong sides touching, iron, and sew in place. Do the same on the other short side. Fold 3/4" down and sew in place along both longer sides, too. This is what your rectangle will look like, no raw edges. Now on to the flaps. Fold short sides down toward center, flaps should measure 4", iron, and sew in place, you will sew about 1/8" from the edge along the longer side of the rectangle (start and finish at places marked with black on the picture, backstitch at the beginning and end). Please don't pay attention to my 7" flaps, that was my first cover and they ended up being unnecessarily wide. There you go. Wasn't that easy? One very simple and quick book cover is done. Don't these textbooks look so much better? You can use this easy method to cover notebooks, too. A while back I made this messenger bag for my oldest daughter. She loved having a unique school bag and I loved how nice and sturdy it was and the size was just perfect for all the stuff she needed. Plus, really, don't we all love it when our children enjoy using something we make for them? Right after it was finished, of course, I had to promise my younger daughter to make one for her, too. It did take me a few months, but her new messenger bag is finished. What do you think? I added a water bottle pocket to the side and changed the way handle is attached as well as made some small changes to overall design. I used quilting weight 100 % cotton fabric for the exterior. I went with Michael Miller Sock Monkey and Little Mikes, polka dot fabric is by Amy Butler. I interfaced exterior fabric with fusible fleece and mid-weight interfacing. I used decorator's weight cotton for the lining. All these layers make for a nice and sturdy bag. Oh, and yes, these messenger bags do match my girls' lunch boxes. Somebody please stop me before I make them wear Sock Monkey coats and pants. My plan for this week was to finish Sliced Coins quilt and start cutting into Loulouthi stash for Across the Sea quilt along. Plus, I have two pillow tops that need to be finished and a baby quilt I'd like to donate to 100 quilts for kids. As I was "planning" how to tackle all these projects I ended up somewhere completely different. I can't even believe how far I've strayed - I made two new pillows. Forget the ones I started a few days ago, I made two very unplanned, colorful pillows that make me so happy just looking at them. 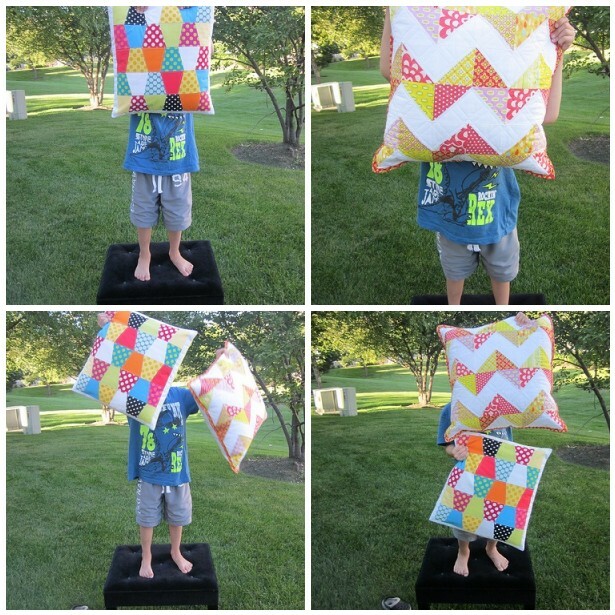 I asked my son if he wanted to go outside and help me take some pictures of new pillows. What can I say? It was great fun. He didn't realize it was really a small pillow, not a quilt, he was holding. HST (half-square triangle) pillow's finished size is 18 x 18 inches. I actually had all these triangles cut, sewn, and trimmed ever since I made my HST quilt. These were the squares I decided not to use in the quilt. And I'm really glad I did that. I love the quilt being in all cool colors and pillow being warms. For my Tumbler pillow I used Go!cutter and 3.5" tumbler die. I went with polka dots and solids, alternating each and making sure no two same colors were next to each other. I framed it with white border and simply finished it off using envelope closure (I was out of zippers and it HAD TO be finished) on the back. This pillow is 16 x 16 inches. I'm thinking it was worth straying from my original plan and making these two happy guys. What do you think? I love WIP Wednesdays. It's great to be able to recap what happened (sewing wise) during the week and see how much, or little, progress I've made. It seems like this week was full of starting new projects. Actually, I don't thing I have ever had so many projects going on at one time. Here we go. I finished quilt top for my mom's quilt. I'm planning to give it to her for Christmas. It's the end of August and I'm working on Christmas gifts?!?! Wow, sometimes I can honestly surprise myself. I'm making Sliced Coins quilt using Don't call me Betsy's tutorial. The fabric I used is Fandago by Kate Spain and the tutorial is very clear and easy to follow. And, once again, I decided to save some money and use Target flat sheet in ivory for sashing. I'm using some of the leftover Fandago fabric to make a matching pillow. I started this embroidery in JUNE. I was planning on making it into a big pouch. After I dug it out from under some piles of fabric a few days ago, I realized that I don't need a giant pouch and I might be better off turning it into a pillow. I added yellow and red borders to bring it to right size. I just need to finish hand quilting the red border and I'll be ready to finish it off. I also made this really fun and colorful quilt-as-you-go log cabin block. It measures 16 x 16 inches and I'm hoping to make 8 more of these happy polka dots and stripes blocks and turn them into a baby quilt. I'm linking this post to WIP Wednesday at Freshly Pieced. Yay!!! I'm joining do. Good Stitches. Dear Farmer, it's time to say Good-bye!